Nicholas Jones is a surgeon of sorts, slicing open bodies to reveal a topography of language – literal and symbolic. ‘To the islands’ is a beautifully crisp show, with a series of 12 modified books presented as specimens of art, craft and museological artifact. Riffing on the idea of the island, Nicholas carves his way into the heart of books through portals spliced into their hard covers. As if with x-ray vision we are guided inside the layers of literary narratives, incrementally descending inwardly in paginated topographical steppes. 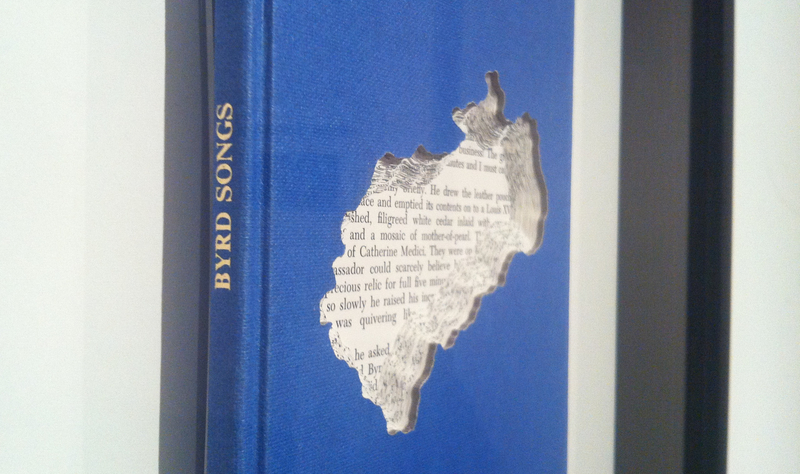 Nicholas frames the book object as island object, an isolated repository of data, an ecosystem of coded hieroglyphs. Where geography is formed by the seasonal layering of mineral deposits, the book is formed by the alternated layering of paged text. Where the erosive powers of wind and water carve out bays, headlands and beaches, the artistic urge carves out form with sharpened steel and intellectual decisiveness. 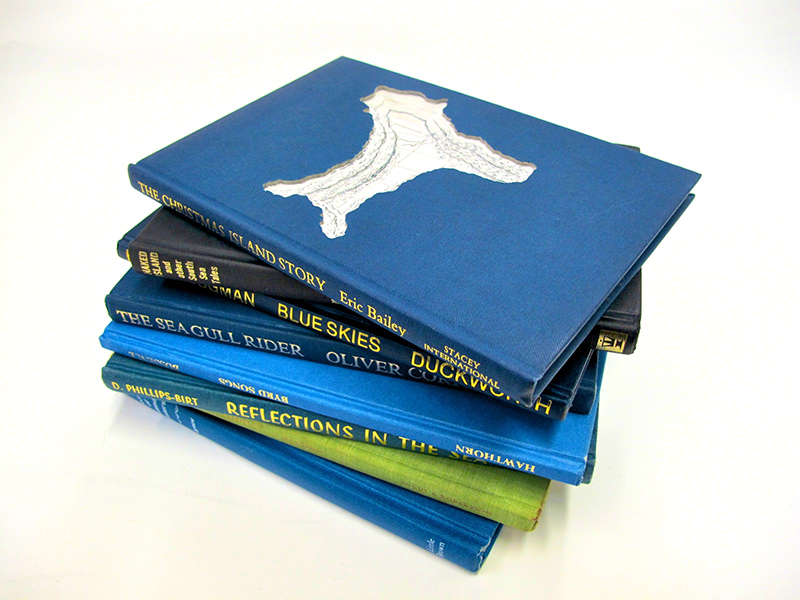 Each book stands alone as an island unto itself, with the island of its subject matter rendered like a heart on its sleeve. Ideas around archeological discovery leap to the fore as well. Where the uncovering of historical overlays send us back in time in teleological leaps and bounds, Nicholas carves us forward through the linear textual narrative. The creation of his islands is a negative casting of form where the reveal brings us forward to the progressive outcomes of the stories rather than backwards to their beginnings. This inversion drives a tension in the work that keeps it alive beyond its striking aesthetic appeal. The selection of the books – their physicality, the colour and materiality of the covers, their size and their spinal texts – all indicate a clearly articulated intent. There is a precision in the work that pivots on the nature of the process, the incredibly dexterous cutting involved in the act of modifying, and extends outwardly in equal consideration to presentation in framing and curatorial design. The titles of the books inform the reading of the sculptures as well. In fact, text leaks its way into interpretation directly as you ascribe meaning to the words on the spine and the words opened to us within the pages of the books; and indirectly as you decipher the fragmented remnants of words revealed by the process of cutting. The fragments along the inner coastal walls of the incised island-forms are especially intriguing. Sentences extracted, phrases edited, words parted. Partially inked graphical inlays become quartz and granite cliff patterns to imaginary land formations. This show couples with Cameron Robbins’ ‘Loggerheads’ at Stockroom Gallery to form a powerful duet of exhibitions. Both shows have at their base an archival record of highly articulated artistic acts forged by energetic forces. And they both emit a heat from the friction of those actions. Lovely stuff. Tags: Nicholas Jones, Stockroom Gallery. Bookmark the permalink.